Could this be the new Dumbledore? Fantastic Beasts And Where To Find Them isn’t even in our cinemas yet (literally just days to go now people) and there are already all sorts of rumours floating around the internet about the movie’s sequel. Arguably the most exciting speculation doing the rounds is who will take on the role of a younger Albus Percival Wulfric Brian Dumbledore? And it seems author J. K. Rowling already has an ideal candidate in mind. ‘I have, of course, thought about this. I do have a name. I do have someone in mind, but I can’t say it,’ she recently revealed. Although the reason Rowling is keeping her casting cards close to her chest is pretty solid. ‘Because if that person doesn’t get cast, then the person who does get cast will blame me forever for having said it, won’t they? So, I’m going to just keep quiet,’ she explained. However, that hasn’t stopped us from speculating who the new Dumbledore may be. Our current guesses range from Ewan McGregor or James McAvoy to Damian Lewis or Hugh Laurie. Join in by tweeting us who you think the new Dumbledore could be. To add to the Fantastic Beasts And Where To Find Them Sequel excitement, we also recently found out that none other than Johnny Depp has signed up to star in the second instalment as dark wizard Gellert Grindelwald. However, not everyone was happy with the news that Depp had been cast to star in the much anticipated movie franchise, following domestic abuse accusations against the actor during his divorce to Amber Heard earlier this year. Now both author J.K. Rowling and director David Yates have spoken out in defensive of their decision to cast Depp, who has denied all allegations. ‘I am delighted,’ Rowling revealed after news of the casting had been released. ‘He’s done incredible things with that character,’ she said of the 53-year-old actor. ‘You have to trust us and see what he does in the movie,’ added Yates, who previously directed the Harry Potter films. ‘He’s a huge Potter fan. He loves the world. He was beyond excited about working on this material. In fact he didn’t even want to see a script, he just said ‘I’m in,” added Yates. Warner Brothers recently confirmed that the second film in the trilogy, currently being called Fantastic Beasts and Where to Find Them 2, will be released in 2018, and the anticipation is already too much. This means that once we’ve watched the highly-anticipated first instalment, we’ll have a rough idea of how long we have to wait to get our next Fantastic Beasts fix. Great news. It’s safe to say that the films are in good hands, as the sequel has again been written by J.K. Rowling, and directed by David Yates (who also worked on the Harry Potter series). In the mean time, you can watch the full trailer for the first film below. While we were silently devastated when the credits of the last-ever Harry Potter movie finally rolled, the news that a spin-off of the magical tale will be THREE movies instead of one has cheered us up no end. Previously, the film released a sneak peek video showing what it’s really like to film in the world of wizardry, and features interviews with Eddie Redmayne, director David Yates and Eddie’s co-stars. Back in December, we brought you the dramatic teaser trailer for the upcoming magical movie, in which Eddie is shown accidentally releasing a suitcase full of his fantastic beasts. The dramatic trailer shows Eddie saying just one line (‘just a smidge’) as he opens his case, accidentally letting the magical creatures out of their cage – with mayhem ensuing. In November, we were given a first look at the movie in the form of Eddie Redmayne as Newt Scamander on the cover of a magazine. 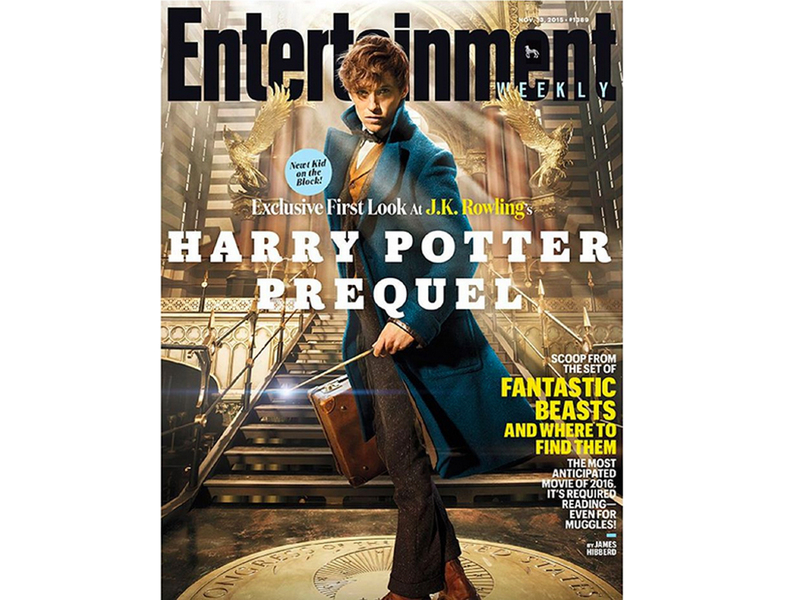 Eddie Redmayne, as Newt Scamander, looks dapper in his turquoise coat, retro briefcase and smart bow tie on the cover of Entertainment Weekly. We can’t wait to see more pictures and get more details of the movie, which J.K. Rowling herself is penning. Rowling previously said: ‘The idea of seeing Newt Scamander, the supposed author of Fantastic Beasts, realised by another writer was difficult. Having lived for so long in my fictional universe, I feel very protective of it and I already knew a lot about Newt.’ I mean, who else could take on the mammoth task of making the Hogwarts textbook suitable for the big screen? The world of Newt Scamander, the fictitious author of the text who goes on a journey to find and document exotic beasts, begins seventy years before Harry’s story – so there’s no chance of Hermione, Ron and Hagrid popping in to say hello. Eddie Redmayne will be playing Newt Scamander, so the film is guaranteed to be a smash hit. Plus, Colin Farrell, Samantha Morton and Ezra Miller will be supporting him, among a whole host of other A-Listers rumoured to be linked to the production. We really, really hope it’s going to be Great-Gatsby-meets-Harry-Potter type thing. And let it be known, we wouldn’t say no to a Twenties version of the Weird Sisters singing all the best hippogriff-themed jazz hits of the day. Yep. Warner Bros are hoping to make a successful franchise of ‘megamovies’ out of Newt and his magizoological ways – which is absolutely fine by us.